First of all, fresh trees are best left with a minimal amount of decorations. If you have to pimp out your tree, then get an artificial. Fresh trees are beautiful, and require very little. Don’t make them into something they are not. Left in their natural state, they are quite lovely. If you insist on decorating your fresh tree with lots of stuff, choose things that are light in nature. Heavy ornaments and lights just weigh down the branches. I am getting ahead of myself. Lets talk about lights. The strands of 100 mini lights are not your only choice. I like to use the c7 clear bulbs. They have clips and you can attach them to the branches to hold them in place. It also does not take that many strands. A minimal amount of c7 is great for a fresh tree. The bulbs do burn a bit on the warm side, so place paper and dried materials prudently. C7’s are the best choice for a fresh tree. 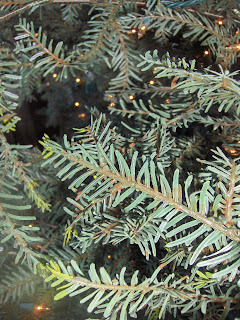 Work the lights from the inside trunk to out near the tips, do NOT hog tie your tree with lights. Round and round is out. In and out is the way to light a tree. Any tree. Poly mesh is your friend. It fills in the bare spots and adds no weight. It comes in every color and it is fabulous. Imagine a loose weave mesh with metallic thread. It is wonderful. It costs about 15 to 20 dollars for 20 feet and it is about 18-24 inches wide. It is a must have for fresh trees. Wrapping paper is great IN your tree. Just cut into strips and used as a garland. Cut it lengthwise. Long strips. You can even wrinkle it up then smooth it back out; its great. I like to use kraft paper or a stripe. If you use wrapping paper in the tree, you can use the same paper to wrap gifts. Its a great look. Do the garland from the inside trunk to the outside, and weave it thorough the branches. And you can cut it into sections to make the paper easier to work with. When you finish, it looks like all one piece anyhow. Sticks are great. And light. And free. Free is good. And you can paint them any color. Dried hydrangeas and pods are wonderful but keep them away from the lights. PERIOD. I don’t want you to burn your house down, for heavens sake. Ornaments should be lightweight. Bows are great and don’t add weight. Silk flowers and ivy are wonderful additions. Burlap is terrific, too. It just depends on the look that you want; organic or bling is king. Whatever direction you choose, just remember to keep it simple, use lots of the same materials to achieve a look of unity, and keep it lightweight. And safe. Since I put up more trees in one season than normal people put up in a whole lifetime, I thought I could share some tips to make your Christmas fun and more attractive. Let me know if you have other Christmas challenges and I will try to answer them in a future post. Oh, and about the picture. It is a close up of my tree. Do you think it is fresh or artificial? Thanks for the tips we are grabing a tree this day, and your blog helped….